For someone with advanced technical know-how and a devious mind, a piece of chalk or some flour or starch can be shaped into a tablet or pill. With the naked eye, it’s almost impossible to tell it’s a copycat. Labelling and packaging are often imitated to perfection. The global counterfeit drug trade, a billion-dollar industry, is thriving in Africa. The markets are flooded with fake and poor-quality drugs, making a trip to the pharmacy seem like a game of Russian roulette. If you pick the wrong box, it could literally mean your death. The WHO defines counterfeit medicine as “one which is deliberately and fraudulently mislabelled with respect to identity and/or source.” Both branded and generic products are faked. In some parts of Africa, Asia and Latin America, more than 30% of the medicines on sale can be fake, notes the organization. The detection of fakes has become more difficult over the years, notes a 2012 study published by the Lancet, because of “counterfeiters’ increased ability to reproduce holograms and other sophisticated printing techniques.” Some even add active ingredients that pass quality test controls but don’t provide any benefit to the user. Roger Bate, an economist specialising in international health policies, believes that substandard drugs—the result of poor manufacturing or “deliberate corner-cutting”—are a much bigger health problem than fake medicines. “Off-the-shelf drugs made by Chinese and to a lesser extent, Indian manufacturers tend to perform inconsistently on quality tests,” he claims in an article for the US-based think tank American Enterprise Institute (AEI). Bate also blames “bad” drugs for the rise in drug-resistant strains of diseases like tuberculosis. For his most recent study, published in the International Journal of Tuberculosis and Lung Disease, over 700 samples of two main first-line anti-tuberculosis medicines were picked randomly for testing from private sector pharmacies. The study found that overall, 9.1% of sample drugs worldwide tested failed basic quality control tests. The failure rate in Africa was 16.6%, about one in every six pills. Meanwhile, Ashifi Gogo, the chief executive officer of Sproxil, a brand prot-ection company for emerging markets, argues that “it isn’t just a problem of counterfeit medicines produced in the East and shipped over to Africa.” Speaking to AllAfrica.com, a news portal, he suggested that the rise of African manufacturers is also contributing to the problem of substandard medicines in the markets. Unfortunately, the penalties for the crime are not strong enough to deter criminals, lead researchers Gaurvika Nayyar and Joel Breman emphasize in a June 2012 report on poor-quality drugs published in the Lancet Infectious Diseases. For example, a 2009 raid in Uganda, conducted by Interpol and the WHO-supported group IMPACT (International Medical Products Anti-Counterfeiting Taskforce), discovered five tonnes of fake drugs in the central and eastern districts of the country. A major sweep across 16 seaports on the east and west coasts of Africa last July allowed the World Customs Organization, an intergovernmental organization that advises customs administrations worldwide, to seize more than 82 million doses of illicit medicines estimated to be worth over $40 million. The fake drugs found during the raid included cough syrup, anti-parasitic and anti-malarial drugs, antibiotics and even contraceptives. However, the raid also exposed the Achilles’ heel of African government agencies in charge of licensing and regulating drugs. Lack of training, insufficient manpower and corruption often plague national regulatory agencies. Furthermore, government inspectors frequently accept bribes and kick-backs to allow the fake drugs to pass borders. 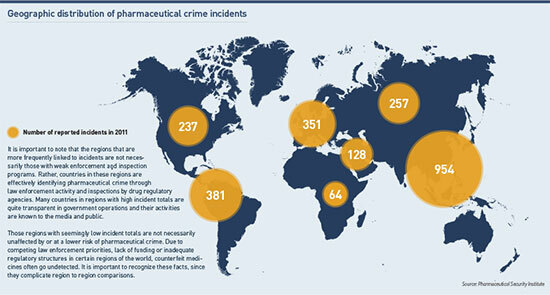 The WHO is helping countries develop the expertise needed to regulate drugs. Drug registration, also called marketing authorization or product licensing, is a thorough evaluation to ensure a drug is safe for consumption. Manufacturing, storage and distribution must also follow strict guidelines. Without registration, the drugs cannot be marketed. To fast-track registration, the WHO encourages national regulatory authorities to choose medicines from its list of pre-qualified products. But it’s up to the individual countries to decide to register a product or not. Seloi Mogatle, Botswana’s principal pharmacist in drugs registration, told the WHO she appreciates “the opportunity to use the agency’s work without losing national autonomy.” But for Bate, AEI’s resident scholar, it’s not enough. He told business and technology journalist Eric Palmer in the publication FiercePharma Manufacturing that “companies making drugs for WHO programs in Africa are manufacturing substandard products.” To remedy that, he recommends that “WHO institute a three–strikes-and-you-are-out rule” for companies making low-quality drugs. Another major weakness of the regulatory agencies is their inability to close what Olike Chinwendu, in her thesis, “The Fight Against Fake Drugs by NAFDAC in Nigeria,” calls the “chaotic drug market.” This includes unlicensed drug vendors—most of them street, kiosk or open-market vendors. Dora Akunyili, former director of NAFDAC (National Agency for Food and Drug Administration and Control), spent eight years trying to cripple the counterfeit industry in Nigeria. Having lost her sister to fake insulin, she saw it as more than a job. She fired corrupt officials, blacklisted over 30 manufacturers and led raids against open-air drug markets. Between 2001 and 2005, the proportion of fake drugs for sale went from 40% to 16.7%. The counterfeit industry viciously fought back, burning the agency’s labs, attempting to kidnap her son and nearly killing her. Her convoy was shot at and a bullet grazed her temple. But “seizing, destroying and penalizing violators” did not root out the fake drug trade, according to Chinwendu. She touts strategies used by Tanzania and Ghana to train, license and regulate illegal drug vendors rather than shut them out. People will continue to patronize drug outlets like open drug markets for first-line treatments, observes Chinwendu, because they’re cheaper. While educating consumers has been crucial in fighting counterfeit medicines, regional coordination has also been an effective tool. Nigeria and Cameroon recently signed a cooperation agreement, promising to share experiences and technical expertise for the war against fake drugs. In West Africa, health and law enforcement officials, together with the WHO and Interpol, have been running multi-country operations aimed at disrupting transnational fake drugs criminal networks. Their latest operation in 2011, called Cobra, resulted in the seizure of 170 tonnes of counterfeit and illicit medical products. China, a global manufacturer of generic drugs and the maker of the award-winning anti-malarial drug, artemisinin, has also joined the fight. According to the Xinhua News Agency, China is installing “recognition and tracing technology on its drugs,” and anti-counterfeit labels are sealed on each drug package. Chinese pharmaceutical companies are also strengthening cooperation with African governments and drug distributors to trace imported drugs. New technology is also revolutionizing the fight against counterfeits in Africa. TruScan is a handheld spectrometer being used at airports and border posts to analyze the chemical composition of drugs, helping to spot “bad drugs” in seconds. In addition, simple and free text messages are being used to check the authenticity of drugs. Start-ups like mPedigree Network and Sproxil have designed systems that allow legitimate drug manufacturers to label their packages with an encrypted code. Consumers simply scratch off the label on the package and text the code for free to the company that maintains the system. The response, sent by text, is instant, informing the consumer whether the drug is real. Countries like Ghana, Nigeria and Kenya have integrated mobile telephony–based consumer verification into their safety regulations. The system is also being replicated in Asia. The brilliance of the service is that it allows consumers to protect themselves, giving them the power. But more importantly, the low-tech innovation is helping restore the public’s trust in the health sector. Africa’s youth: a “ticking time bomb” or an opportunity? What does the ‘Doha Climate Gateway’ mean for Africa? Nigeria’s film industry: a potential gold mine?